Knaresborough's feva festival fights back against fallback with biggest event yet! Organisers of Knaresborough's Feva festival have put together their "biggest event" yet despite a "disappointing" lack of support from the council. For a number of years the non-profit arts and entertainment festival in Knaresborough has been financially supported by Harrogate Borough Council. But the event which runs from August 11 - 20 has not been successful in securing funding, through HBC's small grants scheme, for this year. Vice Chair of the feva Committee, Nigel Perry, said: "Harrogate Borough Council for the last few years have given Feva a grant and that's not going to happen this year but we have made up that amount in other sources and local sponsorship in fact we are probably up on last year. "We were given a years notice so that was useful but for this year there was no grant. It's difficult to understand their thinking. "It's disappointing that there's no support but it doesn't threaten what we do this year. It's the biggest event that we will have put on." However Rachel Bowles, HBC’s Director of Corporate Affairs defended the decision, explaining that £140,000-worth of funding was applied for, through the £30,000 scheme. Ms Bowles said: "The small grants scheme is an annual, competitive process and organisations are not guaranteed funding each year. We need to ensure that this funding is shared with organisations right across the district and that both new and established groups have the opportunity to benefit from it. “The number of groups applying for funding has increased over the last few years and the feva festival has received financial support from the council for many years until last year. “Each year, the council has £30,000 available to help voluntary organisations, charities and community groups develop projects which will benefit the people of our district. "Last year, we received 63 applications asking for over £140,000 of funding. Whilst, we would like to support every worthwhile project, we are simply unable to provide this level of funding. "Last year, 20 groups, including sporting organisations, museums, local charities, horticultural groups, and arts organisations were able to benefit from the scheme. “Whilst we are unable to provide funding for every organisation which applies to the Small Grants scheme, we endeavour to help them to achieve their aims by providing information on other funding sources which they could apply for and offering support in order to improve future applications. 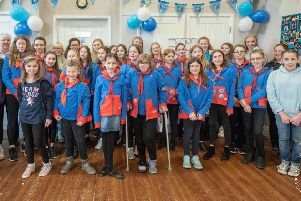 “This year’s scheme is now open for applications and organisations, including the feva festival can apply for up to £3,000 for their project." This August the annual festival boasts music, free street entertainment, spoken word events, theatre and dance and much more. Mr Perry said: "It's something for our people, particularly people with kids and younger people. "It has an arts trail which runs throughout the 10 days of the festival and special offerings from restaurants in the town, as well as a three-day beer festival. What’s not to like?!" A full programme of everything going on at feva this year will be released in June. To see it click here.